His songs have this special quality of staying in your head for a long time. And he has the wit and humor in his songwriting that is something of a rare thing these days (“I’d Sleep With Your Cat But I’m Scared He Might Bite”). Add to this his virtuosity as a pianist. 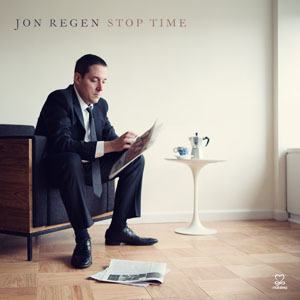 And voilà – that’s the artistry of Jon Regen. If at all, you could compare him to Billy Joel (“Morning Papers”) or Randy Newman or Elton John. The songs have this special timeless status to them and Mitchell Froom adds his brilliant touch as producer. I saw Jon many years ago in some sort of living room concert in downtown Manhattan together with David McAlmont from London – and since then he has really made a big jump in his career. Following it is at least as much fun as listening to the new record. But there is also a very sensitive and heart-warming touch to his songwriting like in “Run To Me”, a beautiful ballad with a catchy piano chord. Or the serious and honest “Walk On Water”. In “Borderline”, he even goes a bit country with an imaginative vocal arrangement. West Coast meets the rural area. In the title track, a sort of jostling little tune coming right out of the 70s, he adresses simple things that nobody really expresses so bluntly (“I Need A Time Machine For A Rainy Day”).